We are heartbroken to share that our dad and our children’s’ Poppy, Bradley Erb, departed from this world yesterday. Brad was by nature a free spirit- unaffected by the confines of modern institutions. He was a joyful wonderer. His life was a parade of happy moments and endless parties! He was complicated. He was wild and uninhibited which was both unpredictable sometimes off-putting, but also strangely beautiful! We see this complex essence in his art- his canes, carvings, his beautiful stories, and even his children. When he died he left the world a mystery. As painful as it is to accept, we will never fully understand him. We take comfort in the truth- he himself was art and the mystery made him interesting, enticing, and whole. We will settle for that and embrace the mystery with the understandable. The most straight-forward was that he was unconventionally proud, fiercely free spirited, and gifted with the ability to find and cultivate beauty in passed over objects and people; he made people feel special. On his journey he made many friends and many enemies, but most of all he left a legacy of laughter and smiles. Our hearts are breaking with the pain from the great emptiness that he left behind, but we know that he will be waiting for us on the other side with a fresh pot of coffee, a bottle of brandy, and good joke. Brad left a legacy of many children and grandchildren. His New Orleans’ children include Anastasia Erb, Haydee Andre Fuselier, and June Green. Rest in Peace, Dad- don’t get into too much trouble before we get there! A private family ceremony will be held at All Faiths Funeral Home on Congress at 10am on Friday, March 22nd. Repast for family, friends, and neighbors at the Fuselier home to follow. 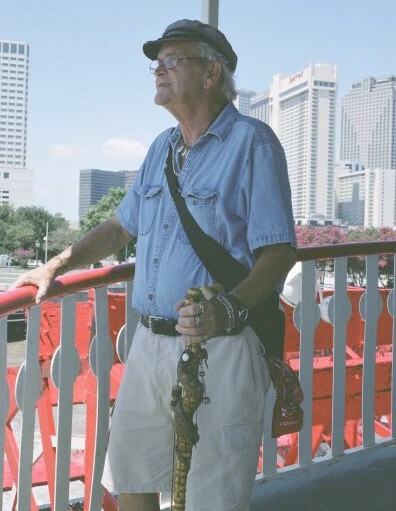 We will scatter his ashes in the places he loved: New Orleans and Chattanooga. A celebration of his life will take place in New Orleans (around Easter).